After finishing the fantastic (and in places fantastical) Far Cry 4 last week, I felt no need to continue picking up the masks dropped by butter-fingers serial killers. Nor was I compelled to download the mish-mash of competitive modes and odd permadeath excursions that’d formed its DLC to date. Valley of the Yetis is something different and intriguing, though: a new open world that takes advantage of Ubisoft’s free-rambling mechanics but fits them into a new structure – one that sets echoes of Minecraft and Fortnite bouncing between the peaks of the Himalayas. The new add-on, out today on PC, plonks protagonist Ajay into a valley high above sea level after a helicopter crash. His first task is capturing a Royal Guard relay station for shelter – and thereafter defending it from an odd cult occupying the area. The passage of time will rule the day, and indeed the night. 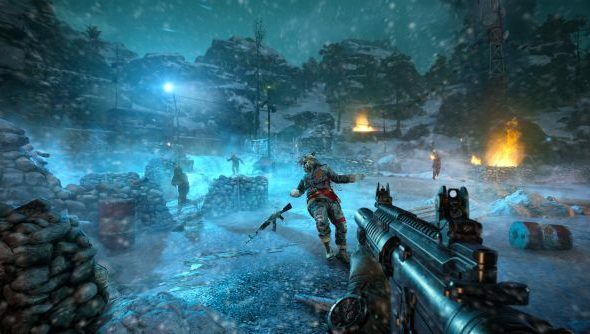 Players must retrieve parts to fortify the camp by completing side quests in the light, before bunkering down to stave off waves of attackers in the dark. And yes, there are yetis – not rumoured or fabled, but real and vicious. They’re quite probably related to the ancient secret the cultists are hiding. The Himalayas were the scene of Far Cry 4’s most confined and straightforward sequences – those that didn’t particularly take advantage of the game’s strengths. It’ll be nice to see some of that spectacular scenery turned to open world ends. The DLC will be available on Steam today as part of the Far Cry 4 season pass or, as I intend to get it, separately. Last month, Ubisoft had sold seven million copies of Far Cry 4. Do any of them belong to you?